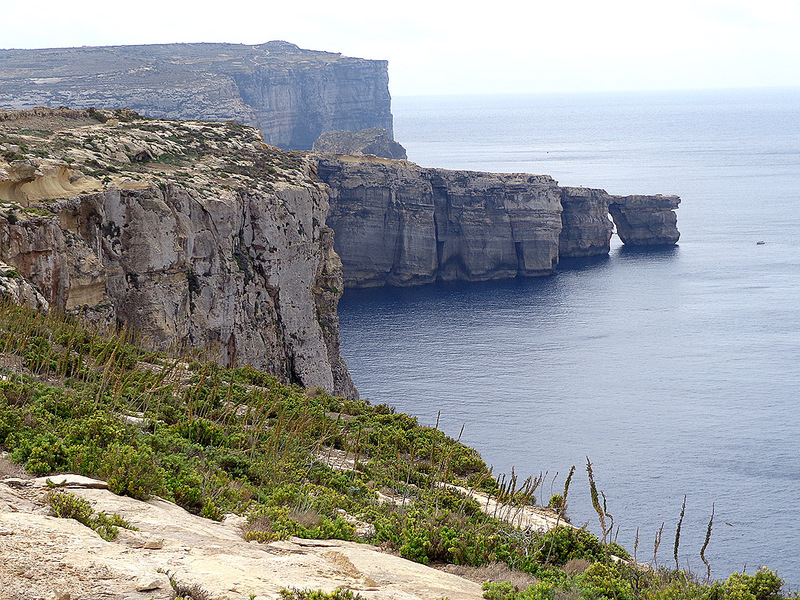 The area to the north of Gozo’s Dwejra, (whose former top draw the Azure Window sadly collapsed into the sea in March 2017) is one of the remotest in the islands. 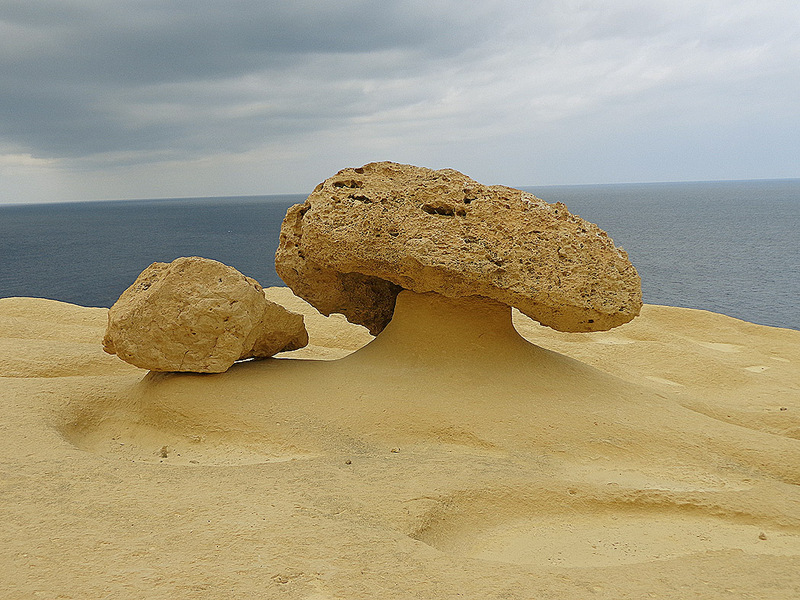 It is an area of high windswept cliffs, breath-taking open views, barren stretches of strangely shaped rocks and (perhaps not too strangely) is one of the least visited areas in the whole archipelago. Here’s a short walk through of the area – an itinerary which takes from three to four pleasant hours to complete. An area of windswept cliffs. 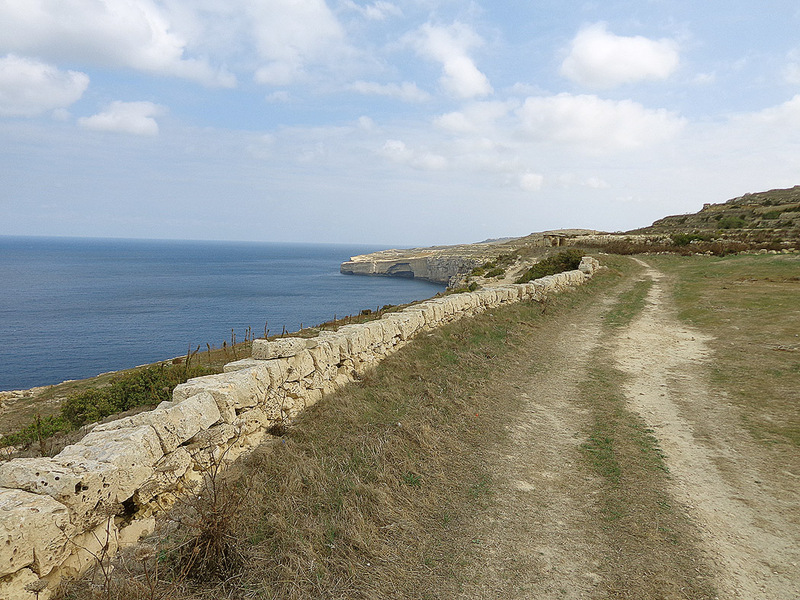 Leaving the car park at Dwejra, make your way up to the small chapel and ascend to the top of the cliff which forms the barrier to the Inland Sea. Keep to the coast as much as possible – if you’re the observant type you will no doubt note the strange grey-blue plant common to this area. 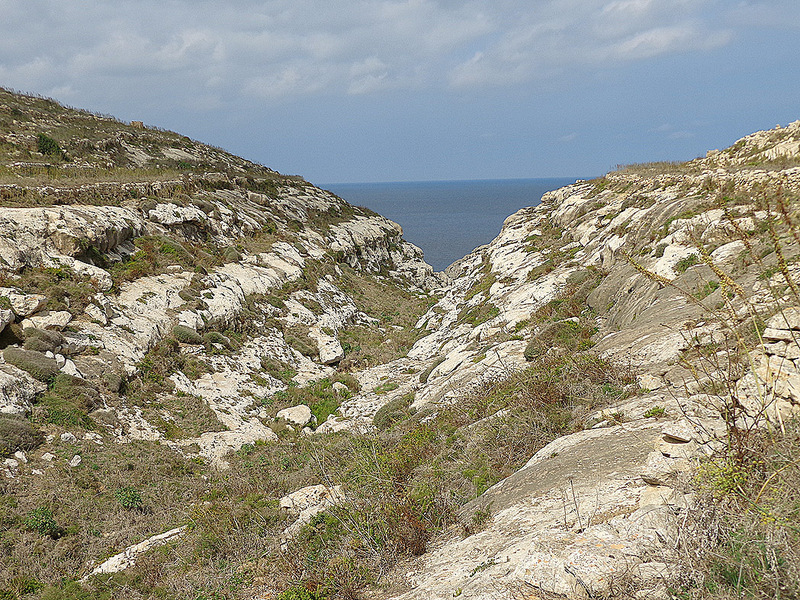 This is the very rare Gozo Everlasting – a species that grows in the wild only in this little corner of Gozo. There are two quarries a little after you leave Dwejra but that’s just about the total sum of human intervention in the area. 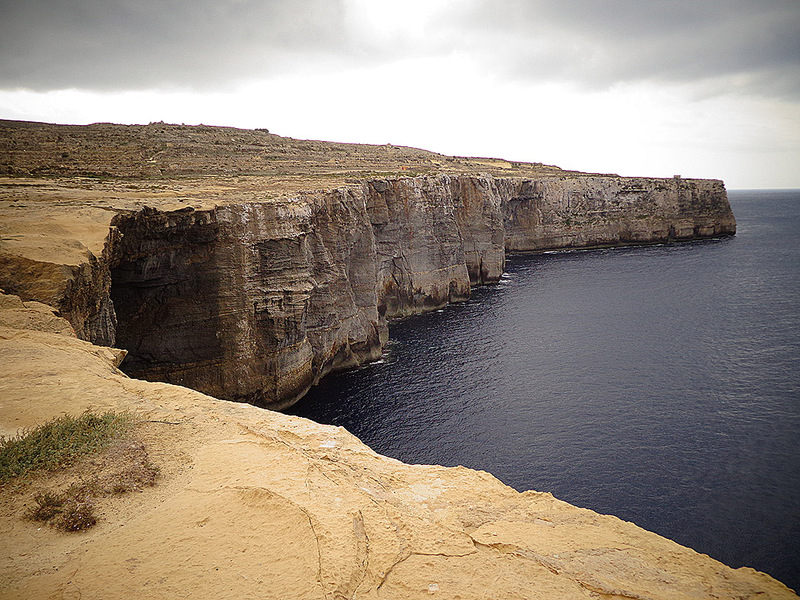 Past the quarries the coast follows a gentle curve leading to San Dimitri Point – Gozo’s westernmost point. The views back to Dwejra are quite something from here – notwithstanding the fact that the iconic Window is no more. From San Dimitri the direction is eastwards and one soon crosses Wied ir- Raheb – a deep cleft of an elevated valley mouth that falls abruptly to the sea below. Beyond Wied ir-Raheb is an area of what appears like randomly strewn boulders – look out for one formation in the shape of a gigantic mushroom! The next river valley is Wied il-Mielah. 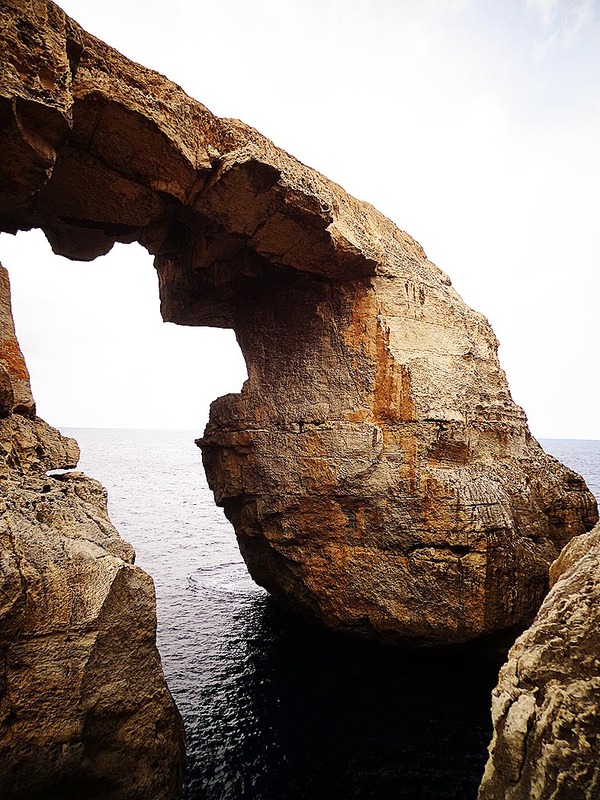 There’s another sea arch here – smaller than and not as well-known as the Azure Window was but still a dramatic one. Steps lead own to the sea for a closer look. Beyond this valley the gentle stony plateau continues on to the third river valley in the area – Wied il-Ghasri. 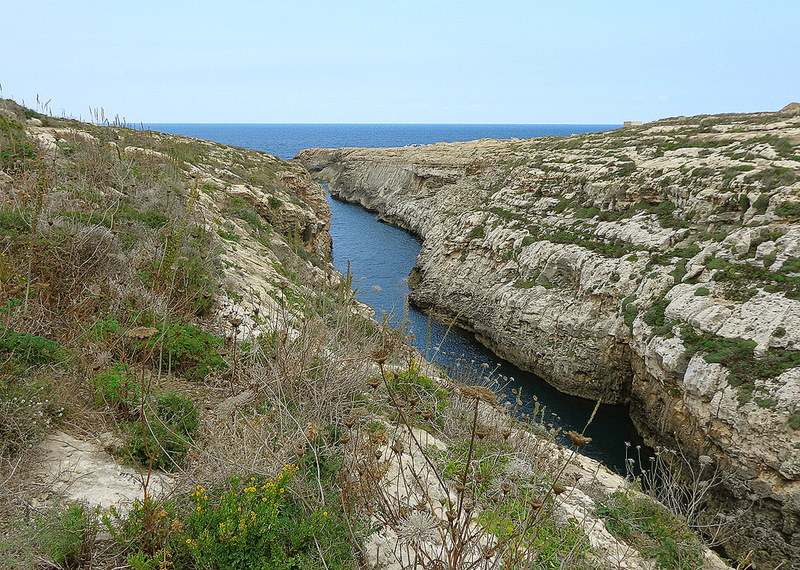 This is indeed a seriously beautiful spot, a deep fjord-like inlet almost alien to the Gozitan landscape. Again there are steps here leading to the tiny shingle beach at the mouth of the valley and the short detour is worth the while. Beyond Wied il-Ghasri the limestone plateau continues past the largest set of salt pans in the islands – still lovingly worked to this day. There’s a small hole-in-the-wall shop which sells the stuff. Past the salt pans there is Xwejni Bay with its curious conical clay tower and beyond that the cove of Qbajjar. Both are popular bathing spots in the summer. One is now almost at the trek’s end and from Qbajjar it’s just a short 15 minute walk to the resort town of Marsalforn. A new window in the making…. 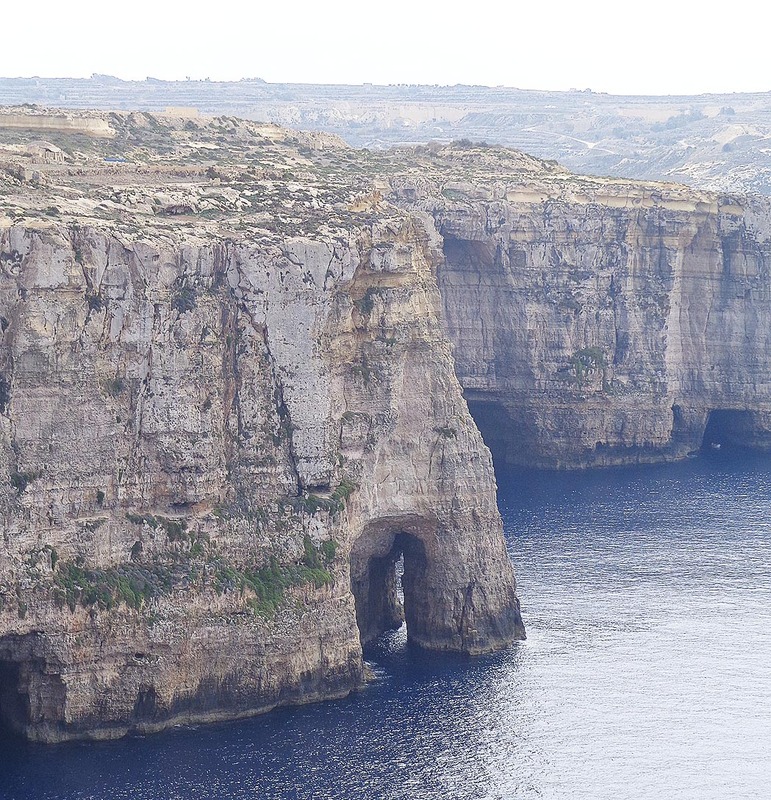 Dwejra is served with hourly buses from Victoria while Marsalforn has regular direct bus services to both Victoria and the ferry terminal at Mgarr.